The 2009 Fall Into Health Fair was full of ??firsts ? 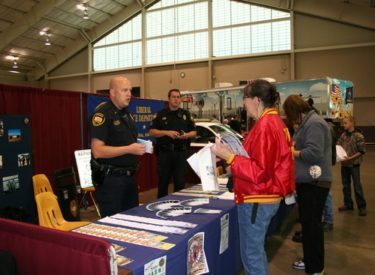 , among which was the distinction of being the first health fair in Seward County since 2001. It was also the first time the Kansas Lions Sight Foundation had not only been able to utilize their new mobile unit – it also set a new record for the number of screenings the Lions had performed on a traveling unit. The second annual fair planned for October 23, 2010 is following that tradition by being the very ??first ? Community/Veteran Health, Job and Education Fair.
? ?A couple of weeks ago, Ed Poley from Whirlwind Career Counseling for Veterans and First Responders, sought our committee ? ?s help in planning a fair just for veterans and it has just taken off from there, ? explained Southwest Medical Center Public Relations Director and fair co-chair Nancy Kletecka. ? ?Rather than have two health-related fairs within a month apart ?? we decided to join forces. So, we changed the name and it has really been coming together. ? The partnership promises to make the event even bigger and better. It will also have a special invitation to veterans for the day.
? ?With the addition of Whirlwind Career Counseling, we have added some extras for veterans, ? Kletecka said. ? ?There will be a veteran ? ?s dinner that day at the Armory with a guest speaker. ? According to Kletecka, veterans will be able to eat free, while all others are welcome to eat for $8 a plate. Space is limited.
? ?Reservations will be required and can be made through the Seward County Health Department, ? Kletecka said. The addition of education and job services to the health fair just makes sense, not only for veterans looking for those services, but for anyone in need of them.
? ?When you talk about health ?? that can encompass a number of things, ? Kletecka explained. ? ?For example, if you need to make a career change, need a place to live, or you are looking for employment ?? that can cause stress which in turn can lead to health issues. Our fair will have possible solutions for all of that and more. ? Kletecka stressed that the event is not a ??hospital ? event.
? ?This is a community event that is for the benefit of the community, ? she said. ? ?Southwest Medical Center is a sponsor for this event, but it is not our fair. There are a number of local and area businesses and organizations that have teamed up to make it possible. ? Kletecka, who serves as co-chair for the event along with Seward County Health Department ? ?s Elizabeth Irby, said others who have stepped up to help out include Seward County Community College/Area Technical School, the United Way, Southern Pioneer Electric, Seward County Broadcasting and various other local and area media.
? ?The local and area media have been phenomenal, ? Kletecka said. ? ?We would not be able to make this happen without their help with press releases and advertising. If you see or hear something about the fair through their various outlets ?? you know they are a sponsor. ? Another change for this year ? ?s event is transportation.
? ?Last year we had pickup and drop off points for people to catch a ride to the event, ? Kletecka said. ? ?This year, Liberal Good Samaritan (another sponsor) is taking appointments for people to actually be picked up at their homes and transported out to the fair. When they are done at the event, they will be given a ride back home. ? Flu shots will also be available this year.
? ?Last year, the health department was not able to get them in, ? Kletecka said. ? ?This year they are already in and will be available at the fair as part of the testing offered. ? Having attendees at the event is not the worry organizers have ?? last year they saw an estimated 600 people go through the doors. It is sponsorships that are the key and that are still needed.
? ?Our committee is doing everything it can to make this event possible, but we can ? ?t do it all, ? Kletecka said. ? ?We need the help and support of those who can step up and make a difference. The amount we charge for people to have the testing done will depend on how much we are able to raise through sponsorships. We hope to someday offer it free to anyone who attends, but we haven ? ?t reached that goal yet. ? Whether or not there is a cost ?? it is still a good deal.
? ?The tests we are offering at the fair would normally cost someone anywhere from $700 to $900 if they had it done on their own, ? Kletecka said. ? ?We are offering them for what basically amounts to an office visit ?? anywhere from $30 to $45. This is not a money making endeavor ?? we know we aren ? ?t going to make money. Our goal with this event is to get people to be proactive in their own health. We don ? ?t ever want to find something wrong with someone ? ?s health, but we do want to find it early if it is there and maybe because of that be able to give them a more positive outcome. If we can help even one person achieve a healthier life, or save even one person ? ?s life by finding something early enough to be properly treated ?? we have achieved our goal. That ? ?s what really matters. ? For more information about the upcoming fair, or to become a sponsor or vendor at the event, contact Nancy Kletecka at 620-629-6335.